The current season of “Key & Peele” will be the last for the show but not the end of the collaboration between creators and stars Keegan-Michael Key and Jordan Peele. The show, which airs on Comedy Central, was nominated for seven Emmy Awards this year, including Outstanding Variety Sketch Series and Outstanding Supporting Actor in a Comedy Series for Key. The show also won a Peabody Award in 2013, and Key performed his popular character of President Obama’s “anger translator” along with the president himself earlier this year. “It’s not because of Comedy Central; it’s us,” Key told The Wrap. “It was just time for us to explore other things, together and apart. I compare it to Gene Wilder and Richard Pryor. We might make a movie and then do our own thing for three years and then come back and do another movie. Saw that event live through CNN where DL Hughley sitting next to Tara Setmayer as a guest on the show commented about the 'Black Lives Matter' movement. When Key entered the stage in-character, I just lost it! ...cause I knew what was coming next...! 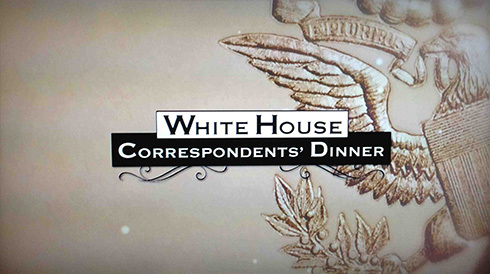 Don't forget to check out President Obama's last White House Correspondents Dinner on MSNBC! Check your local listings, yo! 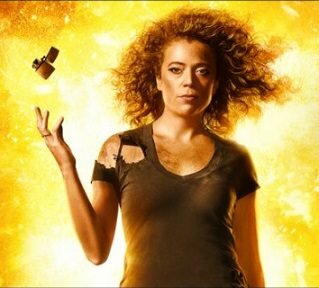 Washington - The White House Correspondents' Association is pleased to announce that comedian Michelle Wolf will be the entertainer at the WHCA's annual dinner on Saturday, April 28, 2018. Since the current guest of dishonor went AWOL last year (like he did during the Vietnam War conflict), this year puppetine plans to do the same. Can Michelle Wolf rock the mic similar to roasters like Mr. Hasan Minhaj, who slayed the twitter troll-in-chief last year, and the comedian-in-chief, Mr. Barack H. Obama the year before that who received the biggest laughs? "We are graced with sarah’s presence tonight. I have to say I’m a little star-struck. I love you as Aunt Lydia in 'The Handmaid’s Tale'. mike pence, if you haven’t seen it, you would love it. I actually really like sarah. I think she’s very resourceful. 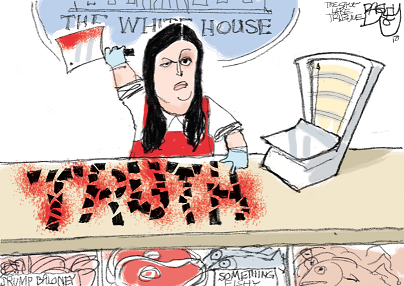 She burns facts, and then she uses that ash to create a perfect smokey eye. Like maybe she’s born with it, maybe it’s lies. 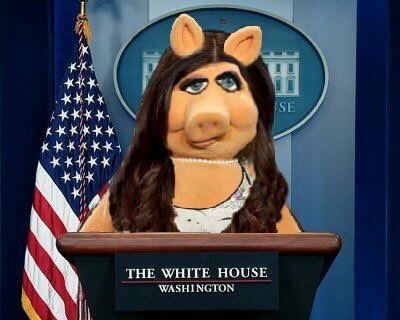 And I’m never really sure what to call sarah huckabee sanders, y' know? Is it sarah sanders, is it sarah huckabee sanders, is it cousin huckabee, is it auntie huckabee sanders? Like, what’s Uncle Tom but for white women who disappoint other white women? Oh, I know... aunt coulter." She blew up th' spot! GET THE F____ OUT, B_____H!!! WASHINGTON – White House press secretary sarah huckabee sanders was asked to leave a restaurant in Virginia Friday night by the business owner because of her connection to the acting-president, sanders acknowledged Saturday on Twitter. emperor puppetine appears to have taken more questions from the media than any commander in chief past and effectively replaced White House Press Secretary sarah huckleberry sanders. 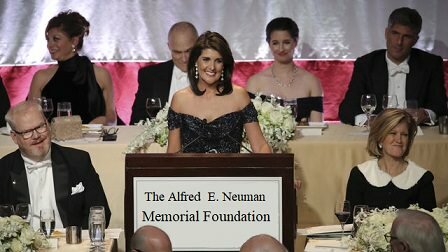 For about 17 minutes Thursday night in the New York Hilton ballroom, nikki haley, emperor puppetines’s soon-to-be-leaving ambassador to the United Nations, tried her hand at one-liners before a crowd of 700 guests at an annual charity dinner, a high-powered event of the political and Roman Catholic elite hosted by Cardinal Timothy M. Dolan. Oh Ho Ho Ho Ho Ho Ho Ho Ho Ho Ho Ho Ho Ho Ho!!! Haha Haha Haha Haha Haha!!! Ooohhh-h-h... stop, nikki, please... you're hilarious! you're sooo-o-o-o funny... Heh heh heh...! Wooo! NO... NO! Really, you are! 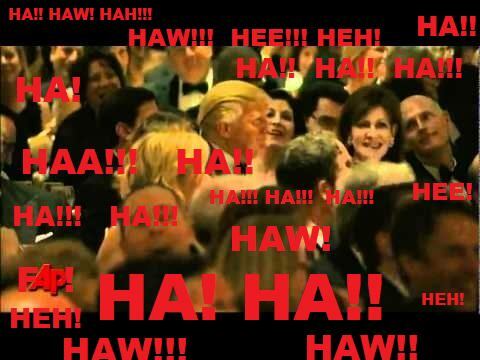 So funny, that you actually think you can become a United States President. Which is not ever going to happen, _______tch! This year, the Executive Mansion Correspondents’ Association dinner will have a historian as its host, so Wolf‘s remarks were a real service. At the Cipriani in Midtown Manhattan on Friday, Variety gathered legions of ladies for its annual Power of Women luncheon. Jeff Zucker, there to introduce one of this year’s honorees, the inimitable Christiane Amanpour. Wolf said as part of her opening comments. It wasn’t all politics and media, media and politics, there at the Cipriani, however. Each of the honorees—who, besides Amanpour, included Kacey Musgraves, Bette Midler, Gigi Hadid, and Taraji P. Henson—was awarded for humanitarian extra-curriculars. Likewise, Lifetime presented the event, and welcomed three victims of R. Kelly’s alleged abuse; the three got a standing ovation when they spoke. Musgraves, who was honored for her work with the Grammy Museum, didn’t exactly echo Wolf’s points, but described an instance in which following her instincts paid off. She was fighting to release “Merry Go ’Round” as her first single, but the brass said it wasn’t enough of an upbeat anthem. Musgraves said she wouldn’t feel proud of herself if she changed her plan in order to sell more. Later, Midler, who was honored for founding the environmental nonprofit New York Restoration Project, told a story about being her own boss. “So, I have been in the biz for over 50 years,” she said. “I’m the Marie Kondo of the outdoors,” she added. 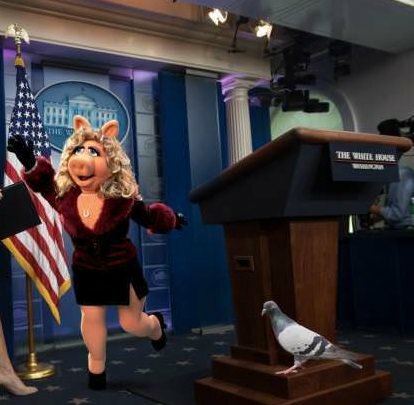 The W.H.C.A. may have folded to pressure and tapped historian Ron Chernow for the dinner this April 27 (the puppet will not be attending regardless), but, thanks to Wolf, Midler, and others, the Variety Power of Women event provided enough material to hold us over until—I don’t know—the end of days? Women really can do it all.